In early June, the failure of the Spanish bank Banco Popular seemed to work smoothly under the new European resolution rules. The relatively new Banking Union seemed to work in achieving its goal to limit moral hazard. Losses were imposed upon junior bondholders and shareholders whereas Spanish taxpayers did not pay a dime. Although there are many defects with the new resolution framework, it seemed to be a step in the right direction. This impression was short lived and died when the Italian government agreed to use €17 billion of taxpayer’s money for two failed banks, Veneto Banca and Banca Popolare di Vicenza, in late June. Thus, Italian senior bondholders will be protected despite the philosophy of the new bail-in framework according which bondholders shoulder losses if a bank fails. 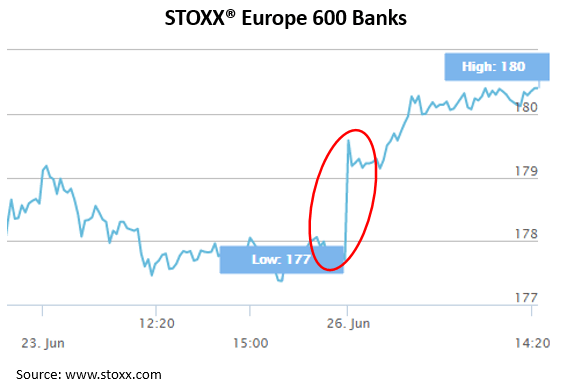 Consequently, the two banks’ senior bond prices rose by more than 15% on Monday. After the 2007 financial crisis and during the 2010–2012 debt crisis, the European banking sector was weakened to a considerable extent. Consequently, the European Central Bank (ECB) and national governments made an extensive use of bail-outs to stabilize the banking sector. As an unintended consequence, the liquidity and capital provided to banks meant that the financial position of both the monetary authorities and the national governments deteriorated and the incentives for banks to act prudently were distorted. Ending bailouts is key not only to enhancing market discipline, but also to ensuring that those who appropriate the gains are also those who cover the losses. It would, however, be a mistake to assume that there will be no more troubled banks once the SSM is in force and supervisory responsibility is transferred to the ECB. 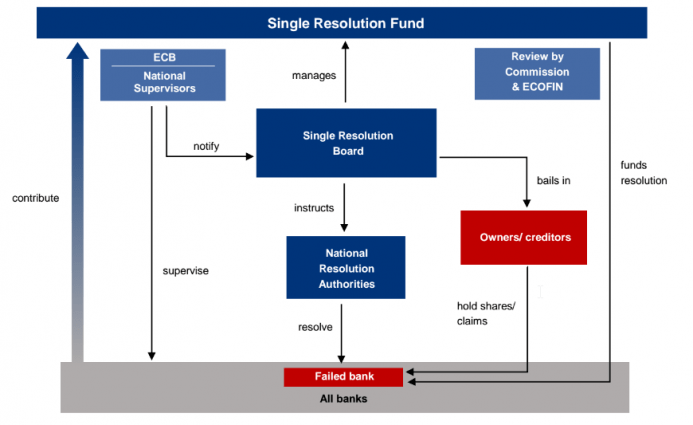 So if the Single Supervisory Mechanism is to be effective, it needs to be complemented by a Single Resolution Mechanism to deal with non-viable banks. The Banking Union consisted in a big policy shift from the “Geithner principle.” This was the principle followed during the 2008 crisis in the US and was defended at all costs by the former secretary of treasury and bail-out fundamentalist Timothy Geithner. Geithner stated that during a crisis, creditors of large financial institutions should not suffer any losses. Bail-ins, on the other hand, put the burden of bank resolution on bondholders, shareholders and in a last resort on large depositors. This means a limitation of moral hazard of the sort which had plagued the euro area before the crisis by creating enormous imbalances. For free-marketers, this was good news. It meant more responsibility into the system and a better pricing of risk. One worry about the new framework however was that some countries would refuse to play by the rules of the game and continue to apply the suicidal Geithner principle. This is exactly what Italy did. With this decision, the European Commission accompanies the Banking Union to its deathbed. The promise that the taxpayer will not stand in to rescue failing banks anymore is broken for good. I am very disappointed that the Commission has approved this course of action. By doing so the Commission has massively undermined the credibility of the Banking Union. If the common set of rules governing banking resolution is so blatantly ignored, there is no point in negotiating any further on a common deposit insurance scheme. The precondition for a working Banking Union is a common understanding of its rules. If such a basic common understanding is lacking, there is no point in further deepening the Banking Union and mutualizing risk. Of course, big banks are perfectly happy with this decision which means they can engage in further credit expansion without the fear of bankruptcy. At the opening of markets on the Monday following the bail-outs (June 26) European banking stocks experienced a significant rise. Upon careful consideration whether resolution action is necessary and proportionate to safeguard the objectives set out in the Banking Union resolution framework, the SRB has today concluded that for these two banks, resolution action is not warranted in the public interest. In particular, neither of these banks provides critical functions, and their failure is not expected to have significant adverse impact on financial stability. As a result, the banks will be wound up under normal Italian insolvency proceedings. But if the failure of those two banks “is not expected to have significant adverse impact on financial stability,” why then did the Italian government decided to bail them out? Clearly, the statement of the SRB contradicts the actions of the Italian government. In fact, the entire rationale behind bail-outs was that it was done to ensure that financial stability is not falling apart. Creditors and shareholders’ misjudgments, not financial stability, are what is insured by taxpayers’ money. Hence, we arrive at the comical situation where Intesa, which will benefit from €5.2 billion in subsidies for taking on Veneto Banca and Banca Popolare di Vicenza, declares that the Veneto banks crisis would have hit the whole industry. But if Intesa is right, this means that as those banks were systemic in the first place, that this crisis resolution should have been taken care of by the SRB and that therefore Intesa should never had benefited from this subsidy. By using a loophole in the European legislation governing bank failures, Italy completely discredited the new banking union framework. Moral hazard won’t die anytime soon. Italian banks will be able to maintain their irresponsible practices until the next crisis were Italian taxpayers will contribute once again. The decision made by Italy is likely to remove all the good that could have been brought about by the replacement of bail-outs by bail-ins. Only the worst traits of the Banking Union are likely to survive. Among them are the centralization of the banking resolution process at the European level and the creation of a European deposit guarantee (i.e., the third pillar of the banking union). For some, it may appear that the banking union was doomed since the beginning because it consisted in the replacement of regulations by other regulations. But as Murray Rothbard explained, some regulations may substantially improve economic conditions in an unsustainable financial system plagued with moral hazard and fractional reserve banking. If the alternative is between governments propping up failing banks and a bail-in framework, then bail-ins are a step in the right direction. However, the interventionist solution to maintain financial stability is profoundly unstable as the State, with the help of the central bank, can protect creditors at a relatively low cost. In other words, it is almost impossible for moral hazard to disappear if the State continues to play a massive role in the financial world. [A] monopoly bank with such close ties to government would have both the incentive and influence to engineer departures from the principle during a financial panic in order to prevent a widespread bank run that would threaten its own gold reserves. … This is exactly what occurred as Peel’s Act was routinely suspended during panics, effectively guaranteeing an inflationary bailout of the banks in future crises and intensifying their inflationary propensity. Peel’s Act thus did not moderate or abolish the business cycle and, indeed, came to be viewed as an impediment to the Bank of England operating as a lender of last resort during crises. As a result, the currency principle was thoroughly discredited and the ideal of sound money was badly tarnished. Similarly, the bail-in framework will prove to be inefficient if loopholes continue to exist and if the ECB continues to be the organization supervising the banking sector. A sound financial system can develop only if central banks are removed from the equation and if we accept without exception a separation of Bank and State. *Louis Rouanet is currently a student at the Paris Institute for Political Studies.